Bristol Rovers boss Darrell Clarke has little sympathy for the Cobblers boss Jimmy Floyd Hasselbaink and the club’s lengthy list of injuries. Town go into Saturday’s clash with Gas without the services of a string of players, with Matt Crooks and Leon Barnett the latest to be ruled out for lengthy spells with knee and Achilles injuries repsectively. John-Joe O’Toole, Chris Long, Sam Hoskins and Aaron Phillips are also sidelined, but there is positive news with the return of midfielder Shaun McWilliams after three weeks out with a foot injury, and Sam Foley is also available to make his Sky Bet League One debut for the club. It’s not an ideal situation for Hasselbaink, but Clarke says such things are simply part and parcel of being a manager, and that the Cobblers have more than enough resources in their squad to cope. “Let’s be honest, I have had six or seven players out for the past three or four weeks, so you have to deal with it,” said Clarke. “For me, they have a big enough squad, they have plenty of players at their disposal, so you just crack on don’t you? We crack on and don’t use that as an excuse. As well as having to contend with injuries, both the Cobblers and Rovers have been affected by international call-ups. Central midfielder Regan Poole is out for the Cobblers as he is on Wales Under-21s duty, while Rovers are going to be without both of their first choice central defenders Ryan Sweeney and Tom Lockyer, who are away with Republic of Ireland Under-21s and Wales respectively. Again, Clarke is taking a pragmatic approach to what is a real setback, and he said: “It’s important we cope without them, and it gives other players the opportunity to come in and stake their claim. Rovers did the double over the Cobblers last season, winning a five-goal thriller at Sixfields with a stoppage time decider, and then thrashing Town 5-0 at the Memorial Stadium in what was to be Rob Page’s final game in charge. Justin Edinburgh has come and gone too since that horrible afternoon, and Clarke feels Hasselbaink has made a decent impact since taling over the Town reins. 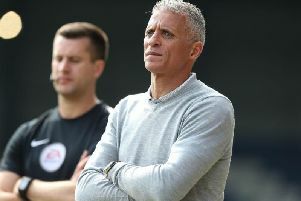 “Jimmy has gone in and he has picked up a couple of results,” said Clarke, who has steerd the Gas from the National League to league one in his time in charge. “He has got them well organised and well drilled, and they have had a win in midweek as well against Peterborough, albeit in penalties, but a win’s a win. The Cobblers can also take some confidence from the fact Rovers have struggled on the road so far this season, having not won an away game since August 19 when the were 3-2 victors at Bury, and losing four of their five played. Rovers have lost their past three league games on their travels at Portsmouth (0-3), Wigan Athletic (0-3) and Bradford City (1-3), but Clarke is not worried about his team’s lack of success on the road as yet, insisting they are not alone in struggling in that department. “It’s one win in five for whatever reason, and I think if you are going to be successful you need to win seven to 10 of your away games in a season,” the Rovers manager told bristolrovers.co.uk. “It is obviously an area we need to improve on, but I think we have been a little unfortunate last season and this season to a certain extent, but that’s football, you don’t always get everything. “If you look at the teams that are winning away, there are only a few who have won more than two games away from home already. “That is how difficult it is to win away games in any league, and in league one as well.